1. Choose a walkable destination. Select a hotel within walking distance of the meeting venue, restaurants, activities and shopping, so participants won't need shuttles or cabs. Also, make sure the venue is accessible to the airport by mass transit. 2. Eliminate specific branding. Don't imprint the year or theme branding on signage and promotional products. These items can be reused from year to year or for other events held by your organization. 3. Save money on waste-hauling charges. Many venues charge for waste hauling from the show floor but don't charge to recycle. Minimize the amount of collateral you bring, then donate whenever possible and recycle the rest. 4. Buy locally. Purchase products at your meeting destination to save on freight charges. Also, ask vendors such as general services contractors and A/V companies to hire local workers who don't need hotel rooms and per diems. Hiring local entertainment and artisans will add a regional flair while reducing costs. 5. Serve beverages in bulk. It's now common knowledge that eliminating individual bottled water can save a tremendous amount of money. Use this philosophy on other beverages, too. For instance, serve iced tea and lemonade in pitchers at afternoon breaks instead of individual soft drinks. 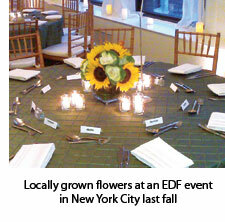 Environmental Defense Fund The New York City-based Environmental Defense Fund has been raising the bar on greening meetings since it was founded in 1967 to fight the use of the pesticide DDT. "It is understood throughout the organization that we need to walk the walk as much as possible," says planner Beverly Atkins, an 18-year EDF veteran who worked on the group's main internal meeting, an annual three-day staff retreat for about 350 people, until last year and now handles board meetings and donor events. The biggest change Atkins has seen since many hotel companies started implementing chainwide sustainability directives is that salespeople and convention services managers now are much more willing -- even eager -- to show off what they are doing. "In the old days, they might have processes in place, but they wouldn't want to show you, thinking a potential customer doesn't need to know about it," she says. "Now I have companies that want to take me on that tour. I've gotten unsolicited back-of-house tours that I've never been offered before. It's good to know what's going on and how it's happening." Indeed, Atkins now has more confidence in the venue choices she makes because she has been shown how they handle recycling, composting and leftover food (preferably donated). Local and seasonal sourcing for F&B, which recently has become more widespread, has been a staple of EDF's events for a decade or more. "One of our main goals is protecting our oceans and ecosystems," Atkins notes. "We take a critical eye to our seafood -- where it's sourced, whether it's farm-raised, the health of the fishery, the scientific information we have, how it's harvested, whether it is line-caught or brought in by trawling. We often ask the chef to talk to his supplier before we approve an item." Finding caterers specializing in organic, sustainable dishes has gotten easier. "There's a ton of them now," says Atkins. "I can choose based on other criteria besides what is offered on the menu. Are they hard to work with? Are they pricey?" For EDF's meetings, almost all distributed materials have been eliminated (they are offered as downloads for any feasible portable reading devices attendees might be using). Atkins is quick to point out what a savings that is for the organization, taking into account the cost of producing briefing books, distributing them and cleaning up all the paper attendees used to leave behind. This policy includes the news; EDF suspends newspaper delivery at hotels, because guests usually just pull the papers into their rooms and never read them. The organization long ago eliminated most giveaways, only occasionally handing out items like pads and pens. Atkins says the proliferation of companies offering premiums made from recycled and repurposed materials alleviates some of EDF's concerns on that score. "The costs of these things have been reduced dramatically, as well," she says. A rider to EDF's hotel contracts spells out all the details, such as recycling, meeting room temperatures, food sourcing and more. "If anything related to the property needs adjusting," says Atkins, "all those things go in our green rider." Intel "Intel has a sustainable events program to improve the triple bottom line: environmental, social and economic," says Lou Cozzo, executive speech and event services manager in corporate events marketing for the Santa Clara, Calif.-based technology company, which ranked fifth on Newsweek's list of green companies. One solid example: the Intel Developer Forum, held in China every spring for about 4,000 attendees and in San Francisco in the fall for almost 6,000 people. Green practices in place for these mammoth events have been codified for the rest of Intel's meeting and event planners in the "Blue Guide to Being Green." Among other helpful tools for planners are an information hub for event sustainability that includes an Intel University-accredited training webcast and a downloadable self-help manual; a step-by-step planning process with supporting templates to help event owners integrate green practices in their plans; supply-chain tools such as a list of sustainability expectations for suppliers, request-for-proposal language and contract clauses; and measurement tools for tracking best practices, the use of resources and savings. Planners also have access to Intel Event Express, a website on the company intranet filled with pictures of props, exhibit booths, signs and more that are available for reuse. Not only is this an environmentally friendly practice, it's also cost-effective: "If you're a group that doesn't have a big budget, you just order the item and have it shipped to the event without paying for additional props to be built," says Cozzo. "And we get years of use out of them." Intel Event Express has reduced waste and disposal costs by approximately 95 percent since 2003. To get event participants in on the green game, Intel sprinkles information about its environmental practices through "walk-in" content. On screens in session halls and meeting rooms, attendees are urged to recycle and use hotels' linen-reuse programs, the messages supported by fun facts such as how linen reuse at IDF saves an estimated 240,000 liters of water every year. For the 2010 IDF San Francisco, Intel purchased 220,000 kilowatt hours of wind energy in the form of renewable energy certificates. After the event, the Moscone Center provided a report of IDF's actual energy usage (372,000 kWh), allowing the company to purchase enough certificates to offset this year's forum, which took place last month. For IDF China, Beijing's China National Convention Center is an ideal venue, as it was built to recycle rainwater and has a ventilation design that provides about 50 days of natural air-conditioning each year. "Another big category the company is looking at is greenhouse gases and our carbon footprint," says Cozzo. "For years we have been consolidating the shipping of our thousands of pounds of equipment. We're very smart about how we schedule those pickups to have the minimum number of trucks on the road. There's one date, and everybody has to ship out on that date." In fact, United Van Lines is among Intel's vendor partners that have embraced the company's environmental programs. • By reducing the paper materials distributed and offering event details in an app, in 2008, 2009 and 2010 combined, Intel saved more than eight tons of paper at IDF San Francisco. • At 2010 IDF San Francisco, 3,100 pounds of perishable food was donated to Food Runners, a local food bank. • Since 2008, IDF has saved $200,000 by eliminating bottled water and reducing food waste.